Gases are generally colourless and odourless, making it extremely difficult to detect leaks. Tiny gas leaks can quickly build up into explosive concentrations — which can cause considerable damage. Potential hazard zones are coalmines, dumping grounds, petroleum refineries, and even dairies — which emit toxic and explosive gases like methane, nitrogen oxide, sulphur dioxide, carbon dioxide, carbon monoxide, etc. India’s worst mining disaster occurred in Dhanbad in 1965, where over 250 miners died. 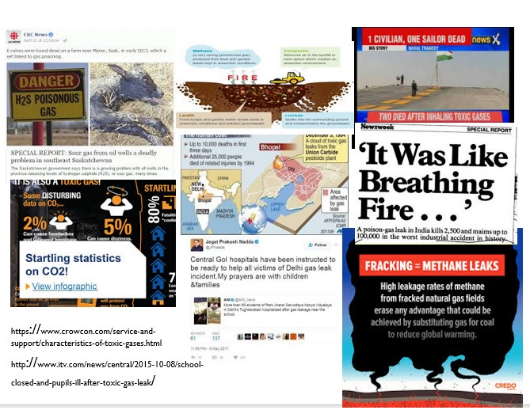 Besides, big cities like Mumbai regularly report fire incidents at landfills like the Deonar dumping ground, due to methane gas leaks. Various technologies are available to detect gas leaks, but they all have limitations. This is what motivated Uzma Memon a research scholar with the IITB-Monash Research Academy, to work on a project titled, ‘2D system for greenhouse gas sensing’. “The existing technologies for gas sensing can be divided into chemical, calorimetric, gas chromatograph, acoustic methods, and optical,” explains Uzma. “Chemical gas sensing technology however, has a limitation of saturation and requires a working temperature of 150oC to 500oC, which can be fatal in the case of explosive gases like methane. Besides, chemical sensors are not immune to harsh environmental conditions. “Optical sensors have far more advantages — high sensitivity, selectivity, and stability with longer life and relatively short response time. For instance, infrared-based IR detectors, which offer high accuracy and safety, but are extremely expensive and have an added disadvantage of needing to be in the line of sight. The IITB-Monash Research Academy is a collaboration between India and Australia that endeavours to strengthen scientific relationships between the two countries. Graduate research scholars like Uzma study for a dually badged PhD from both IIT Bombay and Monash University, spending time at both institutions to enrich their research experience.